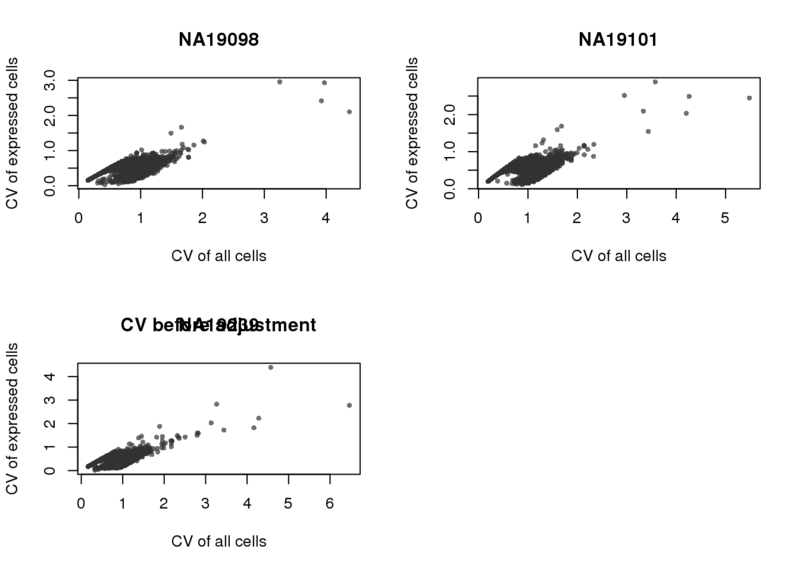 Compare expression variability among the detected/expressed cells between individuals. Our observations made in this document are summarized below. 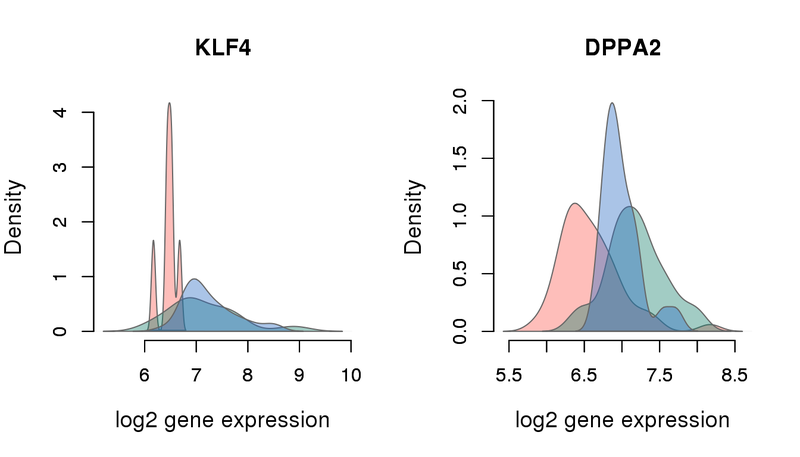 CV-mean relationship: This pattern in the expressed cells is different from the usual concave function we observe in bulk RNA-seq and scRNA-seq. 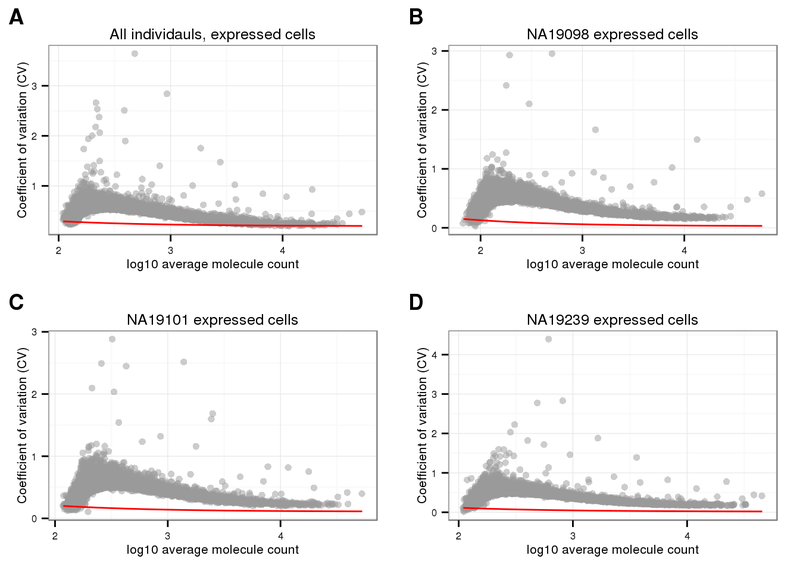 Gene CVs increase as a function of gene abundance for genes with more than 50 percent of undetected cells; while, gene CVs decrease as a function of mean abundance, a pattern similar to previous studies for genes with 50 percent or less undetected cells. 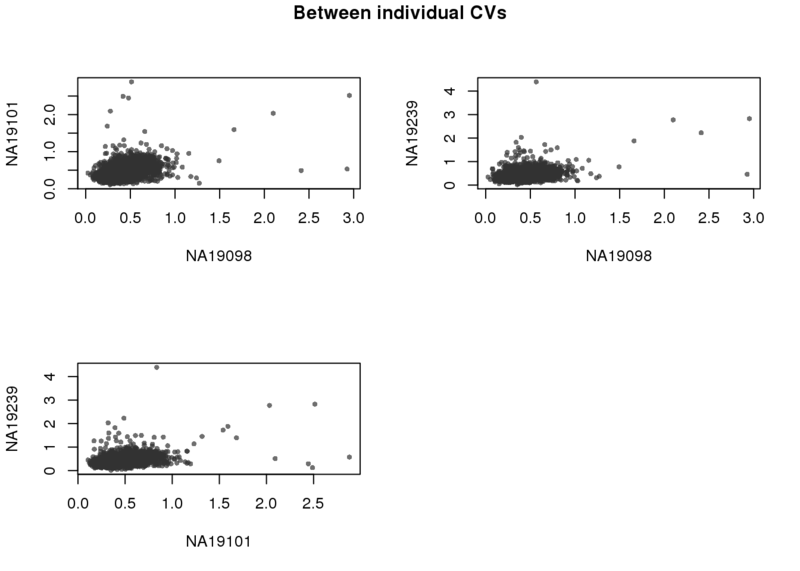 Overlaps of individual top mean and top CV genes: Similar to when including non-expressed cells, there are few common top CV genes across individuals (~100 genes) and many more common top genes across individuals ( > 800 genes). 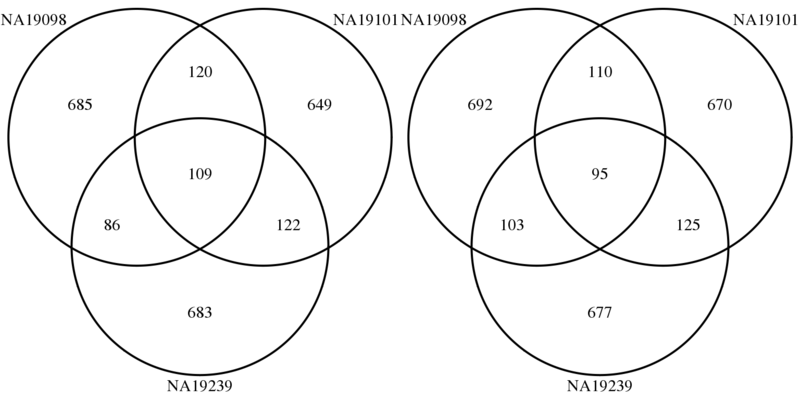 This suggests possible individual differences in expression variablity. 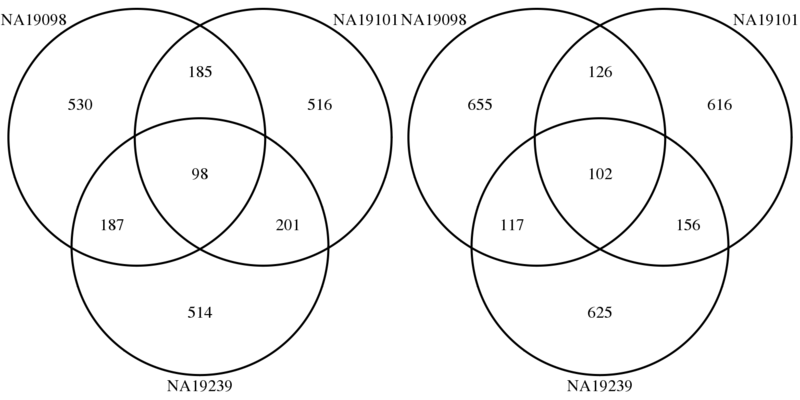 Compare CV of the expressed cells: We found 680 genes with differential variation across the expressed cell. 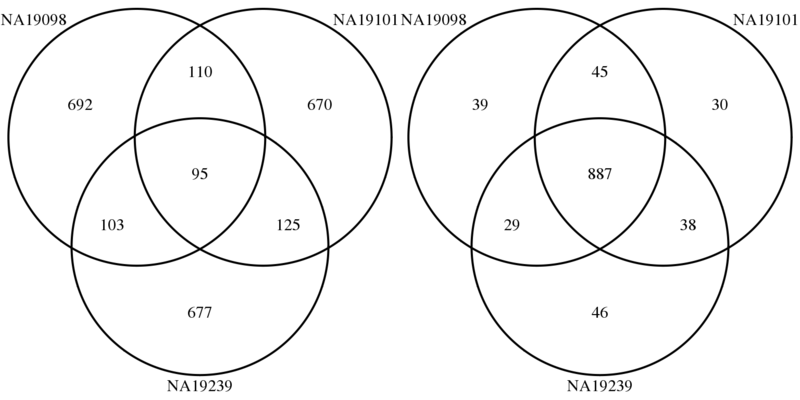 13,043 genes were found to have valid CV and normalized CV (dm) measures in our computations that use a subset of cells with more than 1 UMI. This set of genes is smaller than the 13,058 genes in the final dataset (molecules-final.txt). The difference of 15 genes is the result of filtering out genes that do not have valid CV measures in all of the individuals; these are also genes that we did not detect a UMI in at least one of the individuals. 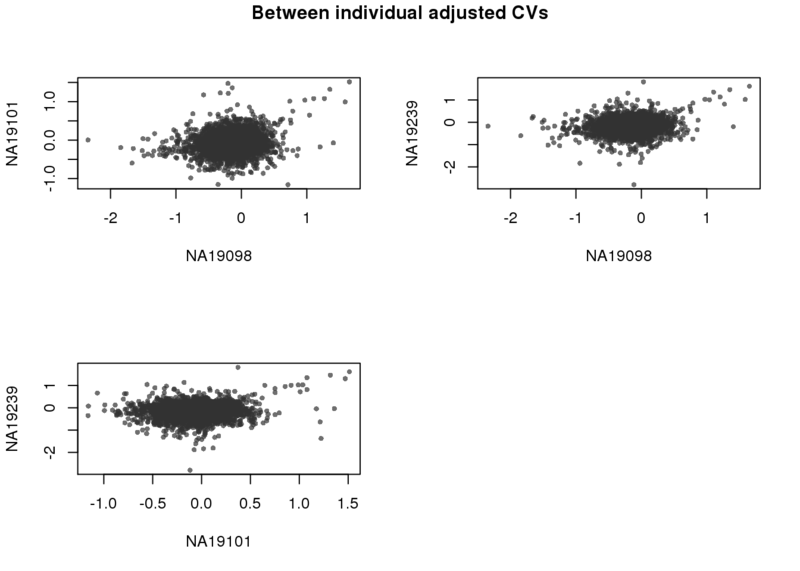 We subset the expression matrices of the 13,058 genes to include only the 13,043 genes with valid CV measures. xlabs <- "CV of all cells"
ylabs <- "CV of expressed cells"
Adjusted CV values are orthogonal between individuals. Load empirical p-values of the MAD values. The permutations were done in midway. 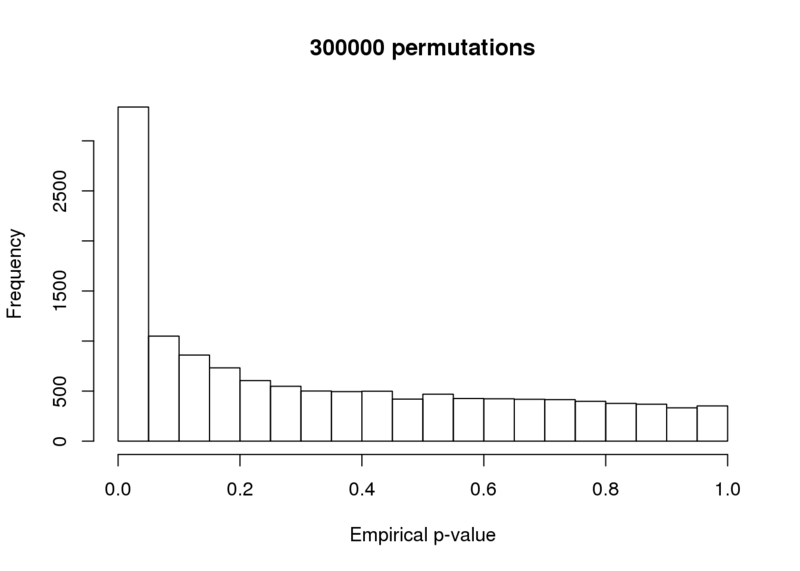 Method: After obtaining the number of permutated statistics greatert than each observed test statistic, we follow the method by Philson and Smyth (2010) and compute the emprical p-value as \(p = (b+1)/(m+1)\) where \(b\) is the number of the permutation-based test statistics that are more significant than the observed test statistics, and \(m\) is the number of permutations performed. # This is an example script used to compute permutation-based MAD statistic. I used CPDB (http://cpdb.molgen.mpg.de/) for over-representation gene set enrichment analysis. The enriched GO term are represented in WordCloud as follows.